The Skunk Works above the glider workshop have worked their magic again with the wings of the Falke being recovered and repainted by a team led by Graham Saw and Mike Sinclair. They have done a splendid job and the club should be especially grateful for the time and effort that they have put in over the winter months on a voluntary basis. The aircraft wouldn't be available if they didn't put in the effort on all our behalf (or cost effective for the membership!) - I am sure you will join me in offering them our sincere thanks. The plan is for the fuselage to be recovered and repainted this coming winter. We can all do our bit to keep it pristine, clean and shiny by ensuring it is washed (and dried please) before it is put away at the end of the day - please don't leave it to "someone else", that person doesn't exist. Great fun flying the easterly ridges of Malvern and Pandy on Saturday. I last flew these ridges many years ago, in my Hang Gliding days. A good 15 to 20 knot easterly on Saturday gave me an opportunity to revisit them. Getting there was easy of course, down wind with 3 to 4 knot climbs to 3500ft. As expected, getting back needed the engine for the last 70km, as the day died, but it was a very enjoyable day. There was plenty going on at the launch point today, on a windy but sunny Saturday. Several people set off on task for Northampton and Bedford, while Geoff (GA) went to Hay Bluff and back - OK so he did get the engine out at Bourton but still a good day out. Meanwhile, a select few were forking out £5 notes for entries to the Easter Egg Cup Aerobatics competition, organised and judged by Graham Saw. There were two classes, Standard and Gorblimey, and some contestants had even practised beforehand - this is serious stuff! There was plenty of advice on offer, and a range of unbiased opinion. To be fair, we should note that Richard and David did the Gorblimey sequence, the others did the Standard one. There were prizes for all, and the proceeds from the entry fee went to the cadet fund. And another thing - congratulations to David Lowe and Matt Porter for getting their Bronze badge after last week's Bronze course. Artist Jane Wood (Oldfield) will be exhibiting some Booker themed pieces in a forthcoming exhibition at the Griffin Gallery. Those of you who attended the end of comp BBQ in 2013 will remember the work below, which will be one of the works. We are all invited to the private view as well as the public opening - see details below. We have been joined by our two seasonal tuggies who are getting prepared for a summer of towing. 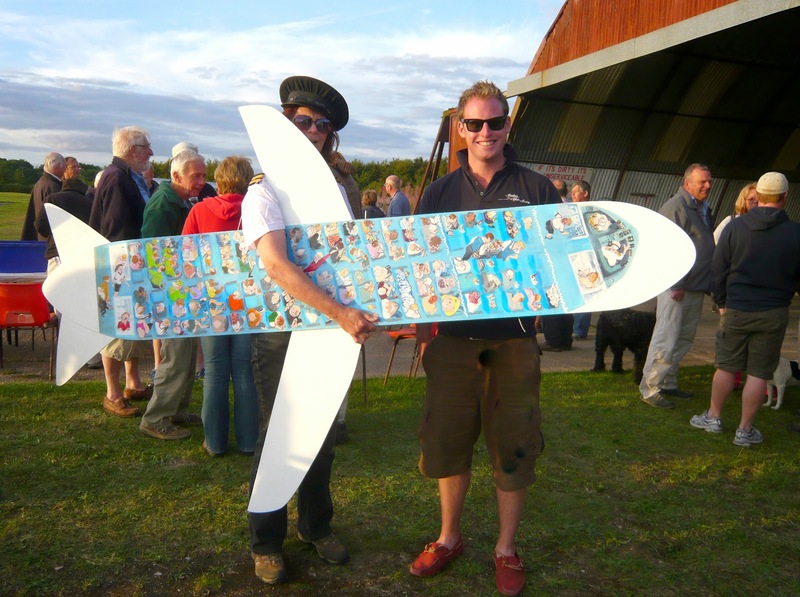 Take the time to say hello to Tom and Lucas who will soon be launching you on your epic flights. Our stay at Talgarth was rather muddier and windier than we could have wished, but we are grateful to our hosts, Black Mountains Gliding Club, for their hospitality and for trying to make the weather better. 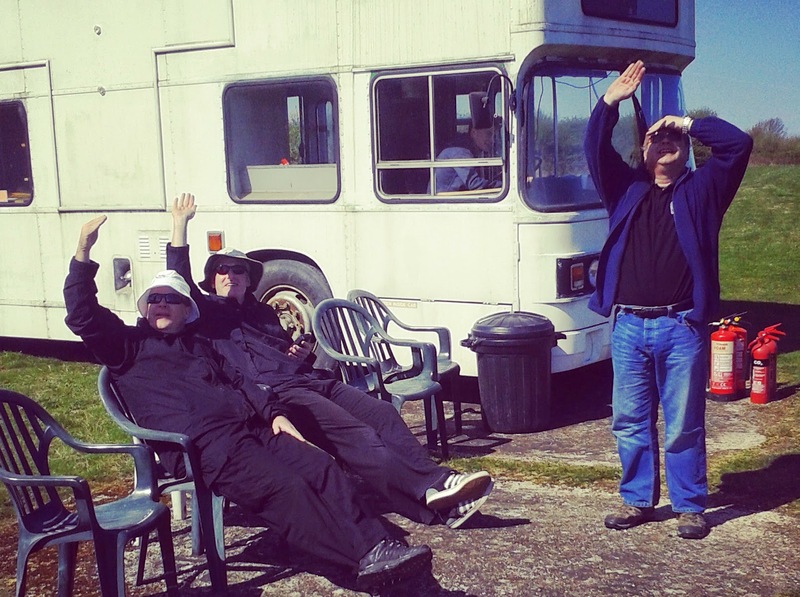 The Talgarth contingent has now extracted themselves from the mud and headed north for a few days at Shobdon as guests of Herefordshire Gliding Club. 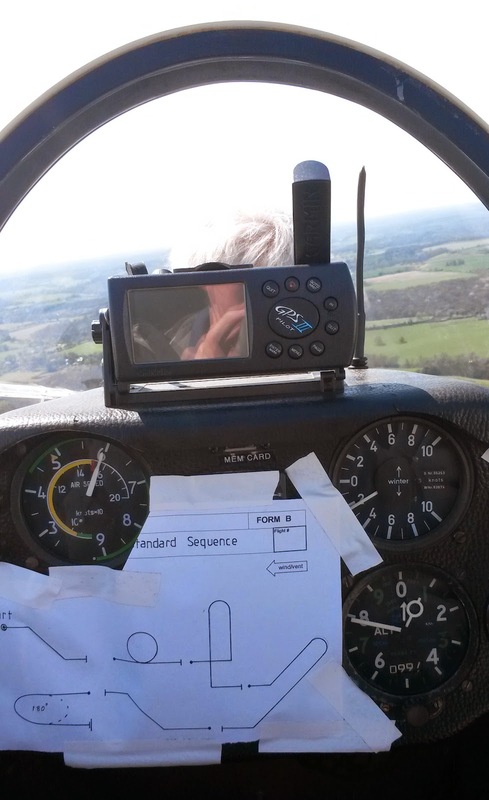 Meanwhile, back at Booker, a group of keen cross country pilots have been under instruction from Tim Scott, weighing their gliders in every possible configuration - wingtips on/off, water in/out, boots/sandals - in order to work out how to get the C of G in the optimum position for racing. Then it was back to the clubhouse to do hard sums with all the measurements. They'll be zipping round tasks at the speed of light now they've got this sorted out. There will be further sessions with the weighing machines for anyone else interested in improving the performance of their glider.